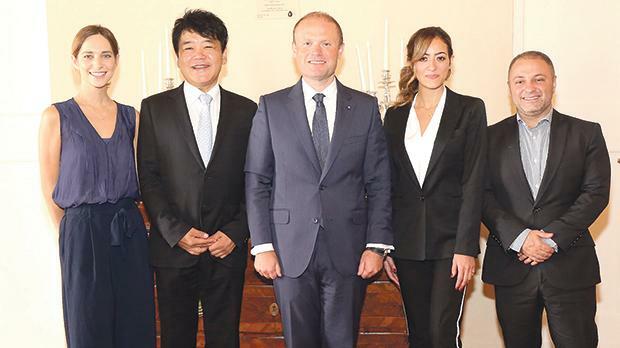 Ganapati representatives with Prime Minister Joseph Muscat. Malta’s aggressive efforts to become the renowned Blockchain Island appear to be paying off. With a stream of international block­chain-based companies choosing to invest in Malta, the island is clearly well on the way to achieving its goal of leading the global blockchain movement. By passing three blockchain-enabling bills into law back in July of this year, Malta became the world’s first jurisdiction to regulate DLT operations, thus positioning itself at the forefront of technical innovation in the blockchain sphere. One such international company taking advantage of Malta’s new legislation is the Ganapati Group. Ganapati PLC, the Group’s parent company, was established in 2013 by visionary entrepreneurs from around the world and is best known for producing unique Japanese-themed slot games. Ganapati’s games offer a new approach to player engagement with their entertainment-focused, often interactive content, all complete with an instantly recognisable Japanese theme. This authentic Japanese flavour – plain to see in titles such as Sushicade, Wild Sumo and Ukiyo-E – is what makes Ganapati stand out from the crowd. Online casino games, however, are not where the Group’s talents end. Its latest initiative comes from new Malta-based subsidiary, GanaEight Coin Limited, established as the legal entity that will issue the G8C token. The G8C token represents an innovative way of merging virtual assets and iGaming, utilising the company’s comprehensive knowledge of both the online casino industry and blockchain tech­-nology. GanaEight Coin Ltd is trying to fill a gap in the market which could potentially revolutionise both industries – online gaming and blockchain – by bringing them together in an entirely original way. With blockchain technology synonymous with transparency, the G8C token gives players an added level of security when betting with it. The token is designed to be bet on its own blockchain platform and can be done so directly without the need for exchanging it into casino chips, avoiding any transaction fees and significantly speeding up the depositing and withdrawal processes. G8C is being branded a new form of stablecoin – unlike conventional cryptocurrencies it will hold a stable value, therefore providing investors with lower risk and greater comfort. This marks a first for the iGaming industry, as no other online casino ICOs are offered as such. Maltese Prime Minister Joseph Muscat, in his inaugural speech delivered at the Malta Blockchain Summit, emphasises the need to embrace innovation and lead the way as pioneers of blockchain technology. With this firm belief, it is easy to see why he previously declared his unreserved support for GanaEight Coin Ltd, backing a move which echoes his own sentiments – the importance of not copying others but rather, being the ones that others copy, when it comes to technology. GanaEight Coin Ltd is making its presence felt at Malta Blockchain Week, sponsoring not only the Summit’s investors lounge, registration counter and Mega Wall, but also two awards at the Malta Blockchain Awards. To kick the week off, the company hosted an exclusive G8C Token Launch Party at Palazzo Parisio, which was attended by hundreds of industry VIPs from around the world and also featured an unforgettable array of Japanese cultural highlights. The success of the launch has resulted in G8C being the talk of Blockchain Week, among investors and operators alike.